A pocket knife might seem like a toy, but it is no child’s play. Its sharpness and versatility can even stun the most shrewd user. Since its inception before several centuries, pocket knives have continued to evolve due to which you today find a variety of styles and designs. No matter which one of them you choose, a pocket knife is still a multipurpose tool. It can chop food, defend in emergency, slice boxes, mince herbs, cut belts to get out of a damaged car, and perform other innumerable tasks. For most of us, a pocket knife is something that can fit into a pocket and is considered as an Every Day Carry (EDC) knife. Despite this definition, the popular Victorinox Swiss Army knife is actually a multi-tool, not a pocket knife. In general, any knife with three or more blades belongs to the category of a multi-tool, while any knife with one or two blades and fitting inside a pocket is a pocket knife. However, if a brand terms its knife as a pocket knife, it is wise to consider it so or else you might ignore some really great tool. This guide is dedicated to buying the best cheap pocket knife for those who are on a tight budget but do not want to compromise quality. Cheap pocket knives are inexpensive and differ from the cheap or junk knives that are not worthy even of handful of dollars at which they are priced. The inexpensive pocket knives are actually handy and reliable utility tools. They are perhaps rugged ones, as you can abuse and hit them without fearing, unlike an expensive knife. Well, this does not mean that you can use a pocket knife in an abusive manner to cause only severe damage. While the market is flooded with high end or upscale pocket knives, the collection of inexpensive pocket knives is also not scarce. You will come across an assortment of knives differing in terms of design, style, and size. While this gives up a lot of choices, it also creates a puzzle as to which one is the most suitable one. Well, finding one such cheap pocket knife is dependent on your requirements. This guide helps you in discovering your requirements and accordingly selecting an inexpensive pocket knife. You will also be able to learn about pocket knives and discover the popular brands known for their cheap models fulfilling a variety of needs. A contractor will use a pocket knife for a different task than what a mechanic will use it. Similarly, this usage will differ for an accountant, cook, and courier man. You also need to consider how frequently you will be using a pocket knife: daily at work, on outdoor trips, only on weekends, or for all. The places where you will be using the knife should also be considered. Will those places have salt water, high humidity, or hot or cold conditions? Depending on this reply, you can determine the best pocket knife for yourself. For example, for all such tasks, a versatile pocket knife with anti-weather surface, large handle to ensure grip in gloved palm, and hard steel blade is the best choice. Pocket knives are simple, but are available in different forms. Still, each one comes with some unique function or characteristic. So, a knife that is ideal for a delicate job is not going to be great at heavy duty cutting. The Way in Which You Will Carry/How Are You Going to Carry: If there is a regular user of a knife having multiple pockets, the carrying capacity is bound to be more. For carrying a pocket knife, you need to consider the length of a knife and the way (clipped or loose) in which it rides in your pocket. Several knives with foldable blade designs come with a pocket clip so that they stay vertical and ride upwards in the pocket for speedy access. Well, this is a tactical design that is not going to please all of us. If you just need a classic knife, a clip less model is what you will prefer. Such models are much smaller in diameter as well as consume less pocket space. However, they always slide down in the pocket and travel in a horizontal position next to your thigh, which can make carrying a knife an uncomfortable affair. With the answers for these two questions, you now know your requirements for the pocket knife. Knife Style or Preference/ What Style of Knife You Prefer: Well, there are two styles to consider, which are already revealed: Classic and Tactical. A classic style model usually features a two-handed manual opening mechanism in case the blade is a folding one. It might not have a lock or a pocket clip, and that its handle may be made up of bone or wood. However, it is admired for its ageless look. On the other end, a tactical knife features one-handed opening mechanism, a pocket clip, a blade lock, and a handle made using metal, composite materials, or modern plastic. They lack the classical charm, but are admired for their unique cool factor as well as increased functionality. Once you know what you need and which style is preferable, it is now time to look out for the below discussed factors. Doing so will help you get the perfect model as per your needs and personal style. When the budget is low or up to $25, there is not much competition or many proven competitors in the race. However, you are bound to get incredible models in this range although they may not be as high in quality as the high-end ones. Even for cheap pocket knives, you would be looking for sharp edge, ease of use, least maintenance, versatility, ease of sharpness, and capability of doing small as well as medium-duty jobs. A shrewd buyer would also like to a mainstream model from a known brand or manufacturer. As per the design style, there are three options namely, the jack, pen, and multi-purpose. A jack knife has a hinge at an end and more than one blade. It is popular amongst campers and people who frequently travel. A pen knife has hinge and 2-3 blades at both ends, each having a different purpose. It is quite light in weight. A multi-purpose knife not only has blades, but tools such as scissors, tweezers, can openers, screwdrivers, and leather punchers. If you do not want anything beyond blade, such a knife can prove to be annoying. It is the most important factor to consider, as it has legal implications. First, you should decide the required length. Usually, a longer blade (above four inches) is required for outdoor jobs and heavy-duty tasks, while a shorter (within three inches) is more preferable as an EDC tool for intricate jobs and is easier to carry. A medium-sized blade within three and four inches is perhaps the most versatile one; it can adjust with heavy use and detailed cuts. Large blades, even if foldable, are legally banned in many states due to which you should not carry them regularly. Many states have laws determining which length of blade is legal and which length is not. Their regulations consider a long blade as a weapon. Thus, do check out the local rules and regulations before you choose and carry a cheap pocket knife. While in government surroundings, the rules can significantly differ! However, a blade of three inches is considered legal almost everywhere. Pocket knives can contain a single or multiple blades. The number of blades for you to choose is dependent on the usage purpose. Several models come with a minimum two blades, which usually are in pen style with a clip, sheep’s foot, or spear point. There are many single-blade models that are simple and feature a locking mechanism and spring-loaded opening mechanisms. They are ideal for a sturdy all-purpose tool but not for sawing and carving through the wood. In case of a multi-tool pocket knife, the number of blades can exceed three and end up to a dozen. Because such blades are useful for several tasks outside home, it is best for a traveler who cannot predict which cutting task will come up next. Well, the con of such knives is that they are not as durable as single-blade models. You will need to choose the knife that has only those blades that you need, or else, it can end up proving irritating to you. In case of pocket knives, keep in mind that always less. Clip Point: Is popular and has an unsharpened edge in a concave shape to give a sharper tip, which is ideal for piercing and slicing (due to deep belly). Drop Point: Is another all-purpose type with a dull area going straight from the handle and then sloping down to coincide with the sharp edge. It is common on survival knives and is ideal for piercing. Straight-Back Blade: Is a normal blade with front being a curved edge and rear being a straight one, which is ideal for slicing and chopping. It is common on kitchen knives. Spear Point: Has edges rising and falling evenly to form an extremely sharp point. It is ideal for piercing only if you sharpen both the edges and somewhat slicing due to small belly. Tanto Point: Is also known as the chisel point with a distinct look and strength. The point is high without belly, but with a flat grind. It is designed for push cuts and cutting tougher stuff. Sheepsfoot Point: Is for those who are clumsy. It has a flat cutting edge and a dull point that makes it tough to harm yourself. It is fine for cutting, whittling, and slicing. Such blades are a choice of emergency saviors who cut out seatbelts without harming the victims. Trailing Point: Possesses an upward curving back for forming a deep belly ideal for slicing. Although the point is fragile, the design is pretty lightweight. Pen: Is small and has sharp and dull sides at the same degree at slope, which gives a resemblance of a spear point. Seen usually on Swiss Army knives, this blade is ideal for small jobs. Wharncliffe: Is much as a sheepsfoot but the back curves near the handle for steadiness and the blade is thicker. It is ideal for carving wood and cutting a variety of stuff. Hawkbill Blade: Resembles the shape of a hawk’s bill and possesses a concave cutting edge along with a dull spine. It is not an EDC knife, but is ideal for stripping cords and opening boxes. While there are many styles and designs to choose from, a few common ones are truly considered evergreen. These are the models that differ in terms of types of blades and shapes. You, too, can consider and choose one of them. Camper: Has a slip joint with a big spear point blade, punch blade, clip point blade, flathead screwdriver blade acting even as a bottle opener, and a can opener. It is usually a multitool model, which can even have some more tools, such as those seen in Swiss Army models. Stockman: Has a slip joint with unique blades namely, sheepsfoot blade with downward curve reaching into flat blade, spey point with dull tip not causing damage, and a clip point for generic use. This one is perhaps the most recommended EDC model. Canoe: Has a slip joint and a shape analogous to the conventional canoe. It comes with two spear point blades acting reliably for generic usage. Alternatively, it can also have one pen blade and one spear point. Trapper: Has a slip joint with a spey and clip blades joined at one concluding part of the handle. Congress: Has a slip joint with a convex front and low or straight concave rear and four blades. These blades are spear, sheepsfoot, pen, and coping as a minor version of the sheepsfoot. Muskrat: Has a slip joint with a spey and clip point blade joined at the handle’s opposite ends. However, the types of blades can vary as per the manufacturer. This can be plain, partially serrated, or fully serrated. A plain edge is ideal for push cuts, such as peeling an apple. It is also gives better control, cleaner cuts, more accuracy, and ensures easier sharpening. However, it is not good at pull cuts such as slicing breads and cutting ropes. On the other hand, a fully serrated edge is ideal for pull cuts and cutting tougher stuff in a better way. However, it is clumsier than plain blades and is tough to sharpen. 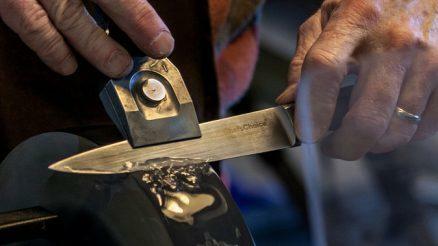 A partially serrated edge allows push cuts as well as hard cutting, but is hard to sharpen. Manual Open: Embraces single-handed and two-hand options. Two-hand opening needs a fingernail, while single-hand opening requires a thumb via a hole or stud. Automatic Open: Opens with a button press but is costlier and no legal in many regions. Assisted Open: Is a mix of the above two systems wherein the thumb initiates the opening and a spring positions the blade fully. In some regions, these knives may be prohibited. Wave: Is basically for tactical usage. It is usually a hook on the spine, which pulls the edge when you pull the tool from the pocket. It is fast and needs some practice to master the technique for flawless opening. Thumb Stud: Is popular and is in the form of a small lifted cylinder on the blade. You only need to apply some pressure on it with the thumb to open the knife. The thumb stud is available in different varieties namely, thumb plates, angled studs, plates working as wave hooks after getting more attention. This is why the latter style is not preferred. Thumb Hole: Features a hole in the blade so that the thumb can easily push to open the blade. It is easy to use and simple. The main benefit as compared to thumb stud is that it needs less usage attention. Instead of a hole, there can be an oval too. Flipper: Is the latest method that works with a small tab or projection. You only need to apply some pressure on the tab to rise above a resting ball bearing in the blade. The method is very quick as well as easy. However, it can be used only with some locks and that the bearing has to be rightly mechanized. Of all the above methods, flipper and thumb hole are really more convenient for daily use. However, a wave is ideal for rapid pulls. While the Spyderco models provide superb thumb hole openers, the Kershaw is known for its flipper and wave openers. By the way, these are some of the most reliable brands for cheap pocket knives. Lockback: Is most popular and has a notch along the spine on which your thumb pushes the locking mechanism. However, it is not for one-handed operation. Frame-lock: Involves a side of the frame gliding beneath the fully positioned blade, thus locking it. This system is highly secure and easy to run with a single hand. Liner-lock: Is similar to frame-lock, but only a side of liner locks the blade, while the rest of the handle remains in place. It is very secure and more affordable to frame-lock. Usually, this is high carbon steel, stainless steel, or high carbon stainless steel, each differing in terms of edge retention, hardness, and sharpening ease. To pick the right steel, it is recommended looking just for an alloy name such as 8Cr13Mov or 440C. If the alloy name is not listed, it is not worth paying over $25. Your carrying choices and expected comfort level determine the best handle. A large handle is ideal for gloved or large hands, while a slim one is fine for a compact knife or for those who do not have the grip issue. When it comes to choosing a material, a classic knife usually has a plastic or wood handle, while a modern one has a metallic one. For a tactical model, composite material or rubber is the common choice. Is sturdy but compact model with seven tools in its 2.25 inch length, ideal for all outdoor movers. It comes encased in a stylish solid-colored housing that also offers tools such as small cutting blade, scissors, plastic toothpick, metallic tweezers, screwdriver tip, and key ring for transport. Is extremely lightweight yet strong model with 2.1-inch fine edge blade with drop point offering one-handed opening and frame lock. The blade is made using 7Cr17MoV stainless steel, whereas the handle features better corrosion resistance due to its titanium coating. Offers a partially serrated blade that measures 3.25 inches in length and 3mm in thickness with spring-assisted one-handed deployment and liner lock. The handle is of aluminum, but interestingly provides a glass breaker and a bottle opener. There is also a pocket clip for comfortable carry. Is an assisted opening model offering gold, partially serrated blade of 3 inches long and 3mm thick. It features gold titanium coating liner on the handle and on the steel handle. The look is such that it becomes tough to resist. Although in gold, the blade cuts rapidly and effectively. Is a spring assist model facilitating quick one-handed deployment and secure lock with a liner lock. It features 3-inch blade measuring 3mm in thickness with straight edge and stainless steel construction, pakkawood handle, and a pocket clip. The modern pocket knives under $25 are bound to amaze you with their strength, performance, and durability. It is wise to consider all the aforementioned factors while choosing one such pocket knife. It is just that do not expect the best piece at this price point, in terms of capability to deal with tough jobs and durability. However, you should expect a pocket knife that is reliable for most small and medium jobs you do in your daily knife.